Lovely condition Early 20th Century Grocers Advert in its Original Oak Frame. Unusual as the advert is hand painted...so maybe a one off.."THEY ARE SO TASTY. 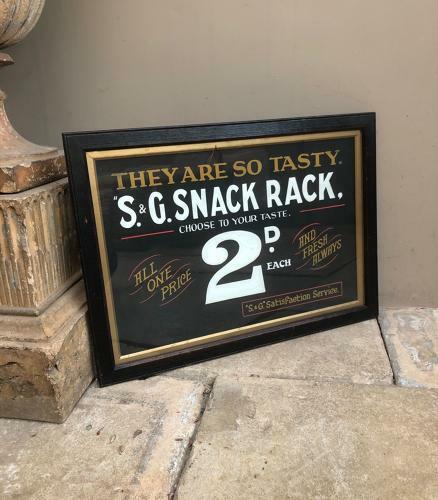 S&G SNACK RACK. CHOOSE TO YOUR TASTE. 2D EACH. ALL ONE PRICE. AND FRESH ALWAYS. "S&G Satisfaction Service). Can possibly post Parcel Force 48 for £18.